The Lab is equipped with many different resources allowing for a wide variety of studies. 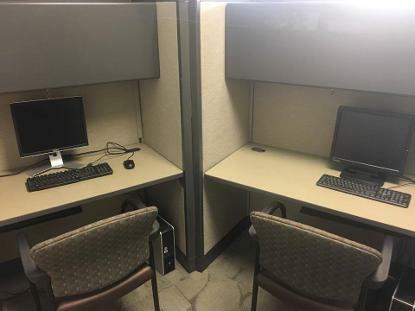 We have a room devoted to stimuli presentation and response time measurement, a room for interviewing/clinical interventions, and a control room for (1) monitoring participants, (2) developing stimuli presentation modules, (3) a data analysis station, and (4) a human-computer interface design station. We have the capacity to do a variety of experimental research using various stimuli presentation methods, survey research, ecological momentary assessment, and ecological momentary interventions. The lab currently has 50 Samsung Galaxy Media Players which operate on the Android system. These are used for EMA/EMI research. The experimental stimulus presentation room contains three PCs and utilizes both Inquisit and Matlab with the Cogent toolbox as the primary programs for stimulus presentation. There are various response apparatus options (e.g., joysticks, button boxes, etc.) most of which are designed in the lab specifically for the tasks used. This is where programs for stimulus presentation and training are written and tested. EMA studies are also developed here and then interfaced with the media players (seen on the left). Primary development software used in the lab are Inquisit and Matlab. In addition, we use a proprietary Android Momentary Assessment program. The lab currently has 50 Samsung Galaxy media players for use in ecological momentary assessment and intervention research. The models operate on the Android system and connect to the University network via wifi allowing for real-time monitoring of data collection. This station has a customized desktop with dual quad processors for intensive data analysis. The lab utilizes STATA and MPLUS as the primary analysis tools. This workstation also has HLM (multi-level modeling), WinSteps (Rasch Modeling), and NewMDSX (multi-dimensional scaling). This station is used to design human-computer interface response apparatuses (e.g., joysticks, button boxes, etc.). Most interfaces used in the lab are designed and tested at this station (and the programming station) prior to being implemented in our research.